Infographic | Water Kills Houses | Eby Exteriors, Inc.
Home » Water Kills Houses » Infographic: Did You Know Water Kills Houses? It’s a known fact that Water Kills Houses. Many homeowners don’t even realize that their home has potential leaks that can be causing all kinds of unforeseen problems. From the roof, basement and foundation, to doors, windows and more, our experience has shown us that there are 7 key areas that should be inspected. Some of these moisture issues can go undetected for years causing major and expensive damage to your home that could cost you thousands of dollars to be repaired. At Eby Exteriors, we are offering a “Water Kills Houses” home inspection for $99. Be sure to call us at (717) 733-9142 or fill out our contact form to schedule your home inspection today! 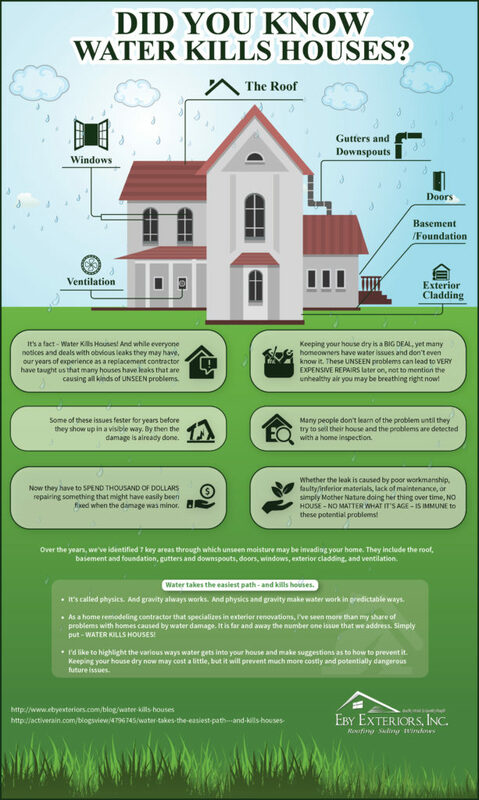 The infographic below shows the 7 key areas of your home that we will inspect for any water/moisture damage.